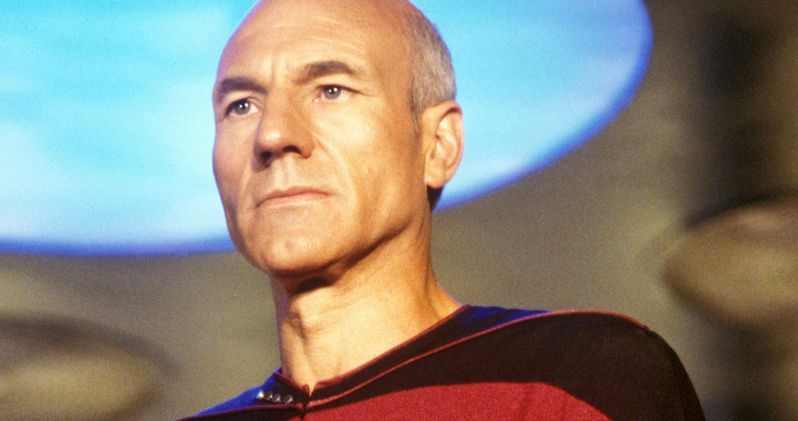 Star Trek fans were treated to the ultimate surprise last month when Patrick Stewart announced that he was returning to the iconic role of Jean-Luc Picard for a CBS All Access series. Stewart posted a picture of himself along with the producers of the new show, announcing that "The journey has begun." To say that fans are excited for Stewart's upcoming Star Trek Picard Series series would be a serious understatement, so it's awesome to know that work has officially started. Patrick Stewart shared a picture of himself as well as producers Kirsten Beyer, Michael Chabon, Akiva Goldsman, Diandra Pendleton-Thompson and James Duff working on the Star Trek Picard series. The team are hard at work in the pre-production process at the moment and it's not clear when the show will actually begin filming, though it could be a lot sooner than previously thought, especially since the series was just announced less than two months ago. Stewart is excited to return to the role and break some new ground for the Star Trek franchise. Specific details surrounding the Star Trek Picard series are currently a mystery. So far, Patrick Stewart is the only cast member that has been officially announced, and fans are hoping that some of the crew from Star Trek: The Next Generation will return as well. Stewart was recently spotted at a dinner with Data (Brent Spiner), Geordi La Forge (LeVar Burton), Worf (Michael Dorn), Deanna Troi (Marina Sirtis) and, Beverly Crusher (Gates McFadden), which led to speculation that the actors were talking about the upcoming season. However, they were more than likely just getting together as friends for a nice meal. Brent Spiner and Gates McFadden both revealed that they have not been approached for the upcoming Star Trek Picard series, but they agree that it's a great idea. It seems like both actors would love to return to work with Stewart, but it remains unclear if they will be back to reprise their roles. For the time being, it looks like the focus is going to be placed on Patrick Stewart's Jean-Luc Picard, which is totally fine with the majority of Star Trek fanatics who are just happy to have the actor back in the franchise. While details are scarce at the moment, we should be getting more details soon since the Star Trek Picard series is already in the pre-production process. With that being said, it's going to be awhile before the show hits the airwaves. Patrick Stewart admitted that he felt that his Jean-Luc Picard days were behind him after they wrapped the final movie in 2002. Obviously, something has him excited about returning to the Star Trek franchise and that's all anybody really needs to know. You can take a look at Stewart and the producers of the Star Trek Picard series hard at work below, thanks to Patrick Stewart's Twitter account.